German 30 year bunds yield 0.6%. Investors are inured to insultingly low yields, but somehow this still shocks. The ECB defines price stability as inflation “…below, but close to, 2% over the medium term.” Assuming it averages 1.5%, investors are accepting a negative real return virtually in perpetuity. Germany’s ten year yields are -0.05%. Could their 30 year bonds one day join them in negative territory? Japan’s ten year yield is -0.08%. 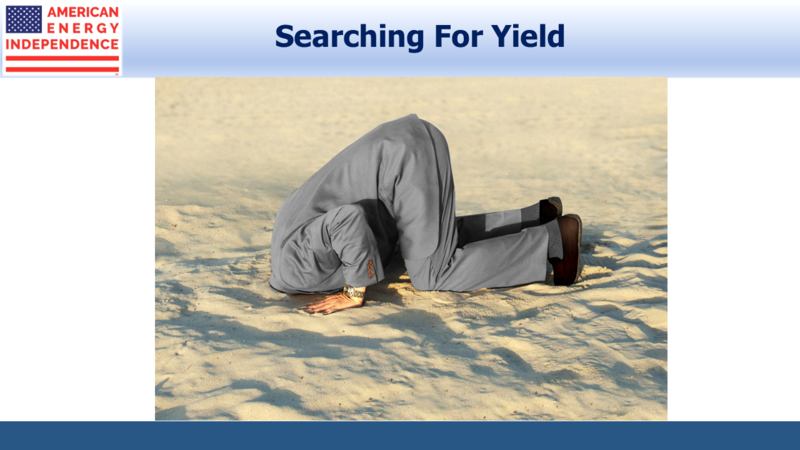 U.S. ten year treasury yields of 2.4% are profligate by global standards. Asset allocations that rely on a split between equities and fixed income persist in maintaining some bond exposure even while loss of purchasing power is guaranteed. Clearly, tens of billions of dollars in assets has accepted this. The stewards of this capital retain a rigid adherence to portfolio diversification. Since falling yields have supported positive returns on bonds through capital appreciation, maintaining bond exposure hasn’t caused visible losses, for now. Perhaps there’s a principal-agent problem here. The certain knowledge that an investment will lose money should cause an investor to change her selection. Self-evidently, if the purpose of saving is to consume tomorrow, when you know your purchasing power will be lower, perhaps you should consume more today and not save as much. If your career is buying bonds for clients, you’re unlikely to promote radical thinking. 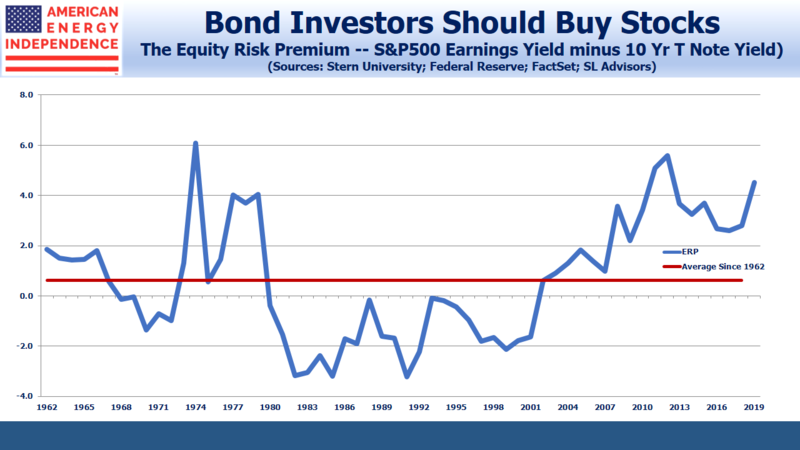 The Equity Risk Premium favors stocks over bonds. This is true even though S&P500 2019 consensus earnings forecasts are being revised down. The current $168 forecast is down $10 since October, and puts the market’s P/E at around 17. But bond yields have also fallen, which has maintained equities’ relative attraction. We’ve often illustrated the wide spread between the earnings yield on the S&P500 and bond yields by showing how little money invested in stocks could generate the same return as $100 in ten year treasury securities. 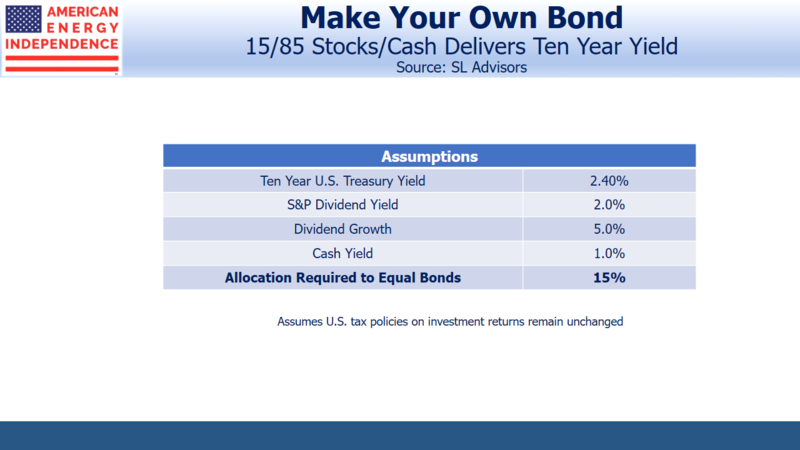 Today, only $15 in the S&P500 would match the return on $100 invested in ten year treasuries at 2.4%, assuming (1) 5% dividend growth (which is the long-term historical average), (2) an unchanged S&P500 yield in ten years, (3) unchanged tax policies, and (4) that the other $85 is invested in a money market fund at an average yield of 1%. Returning to Total and their perpetual bonds – energy has been a miserable sector and is cheap, as regular readers know. Energy infrastructure offers dividend yields of 6% or more, with distributable cash flow yields above 10%. The buyers of Total’s 1.75% perpetual bonds prefer this to the 5.2% dividend yield on its stock. There’s too much money in bonds struggling to find an adequate return. Although central banks have been substantial participants in global bond markets since the 2008 financial crisis, plenty of commercial buyers are also investing at current yields. They’re exhibiting a remarkable lack of intellectual flexibility. When returns are certain to leave you poorer, it’s time for some fundamental questions about the purpose of investing. 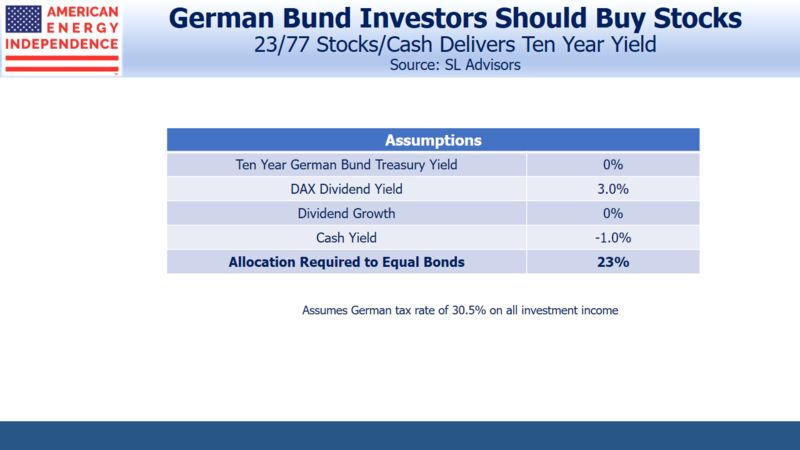 Bond investors will probably have to endure a couple of years of steep losses before making that assessment. By then, the folly of investing in debt at today’s yields will be completely obvious and too late to correct.